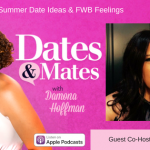 Psychologist & Actress/Writer/Director (Love Don’t Cost a Thing and B*A*P*S) Troy Byer and Comedian Wil Sylvince discuss how to discover which kind of boat you are in a relationship on the Dates & Mates Radio Show. Be sure to read about The 8 Strangest Online Dating Sites! It’s a can’t miss!